Located near Nanchuan City, outside Chongqing, the Gold Buddha Mountain, protruding from the eastern branch of the Dalou Mountains, consists of the Baishan, Baizhi and Qingba ridges, with a total area of 1,300 square kilometers, including 260 square kilometers of the scenic area. 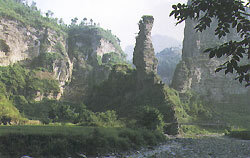 The park is featured by grandeur, varied topography, peaks rising one higher than the other, weird-shaped rocks, deep and secluded caves, and thick forests. 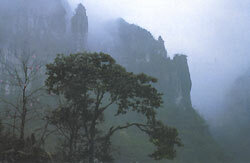 The mountains, streams, forests, rocks and caves set each other off well. The virgin forests take up one third of the total area, and are home to a wide variety of rare animals and plants, including 250-odd species of ancient living things, 136 species of special plants, 82 species of endangered plants and 30 species of rare plants, of which fir trees, square bamboo, large leaf tea, the Azalea King Tree and ancient ginkgo trees are known as the "five superlatives of the mountain." Its abundant botanical resources provide sustenance for 523 wild animals, of which 10 species, including leopards, South China tigers, turtle-patterned leopards and red-bellied pheasants, are first class animals under state protection, making up about 22 percent of all wild animals in China under state protection. Its main scenic spots are Ancient Decree Cave, Smoke and Cloud Cave, Big Treasure Cave, Ten-Li Painted Screen, Stone Board Ravine, South Heavenly Gate, Stone Man Peak, Mount Zhutai, Mount Nanzhu Forest Park, and Lixiangxi Lake.